If there is one thing that is guaranteed to be in supermarkets in November, it’s turkey! In fact, many supermarkets even give them away to promote large purchases of other groceries. As you put the turkey into the oven, take a moment to think about the significance of that bird. Did you know that a vast amount of rabbinic ink has been expended in discussing the kosher status of turkey?! While the Torah specifically identifies those features that make animals and fish kosher (chews cud and split hooves for animals, scales and fins for fish), it does not specify the identifying features of a kosher bird. Instead it states that one may eat "all the clean birds," and then lists only the birds which one may not eat (Deuteronomy 14:11-20). This has created a problem because not all the birds identified in the Torah’s prohibited list are known today. The Code of Jewish Law (Shulchan Aruch completed in 1563) therefore ruled that only those birds traditionally known to be eaten by Jewish communities were allowed. This included chicken and ducks. The turkey, however, was not a traditional bird. Turkeys are indigenous to the "New World" and were not seen by European Jews until explorers brought them back from America. As turkeys became more common fare in the general European community, the rabbis began to receive questions about the bird’s kosher status. 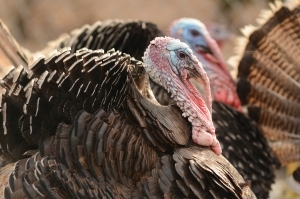 The turkey, which shares many similarities to other known kosher birds – the nature of their stomach, the shape of their beak, the structure of their feet, and that they were not predatory – was deemed kosher by almost all authorities. So go ahead. Stuff the bird! This Treat is republished each year in honor of Thanksgiving.